Rory Mcilroy that is awesome! Cheers! Rory Mcilroy party party party! you are a breath of fresh air Rory. Thank you for the years of dedication you put in to inspire the world. Rory Mcilroy Fantastic~surely the best tasting drink you've ever had in the best "jug" Congratulations! Rory Mcilroy Well done. Back it up at the Open Championship. Golf needs a new dominate player. Cheers! Rory Mcilroy Stayed up here in Bangkok from 3 AM Sunday and Monday morning, skipped my own golf to watch you. Way to go. You've inspired all of us. Could not be more happy for you. Fair play to you lad. Stayed up in Singapore here from 2am-7am local time just to watch it, and so worth it. Outstanding achievement. 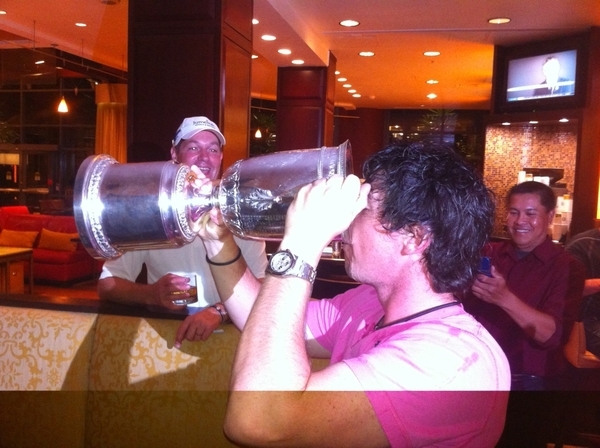 Rory Mcilroy was the cup full of Guinness? Congratulations on your 1st Major here's to many more. Rory Mcilroy what an absolutely wonderful Fathers Day US Open!!! Congratulations Rory! Rory Mcilroy Way to celebrate like you just won the GAA county championships!But I like it!! !You deserved this so much. Well done! Rory Mcilroy congratulations Rory...outstanding golf, the first of many ! Rory Mcilroy Well done Rory - Enjoy!!!! Rory Mcilroy Congratulations ! See you soon at the French Open ! Rory Mcilroy Must be nice to get this major accomplishment in your life mate!! Rory Mcilroy 1 word .. Legend! You made Ireland so proud. Rory Mcilroy Congrats Rors, its not all about tiger red, baby blue assassin strikes! Any reason behind blue everyday? Rory Mcilroy can take the man out of northern ireland, but can't take northern ireland out of the man! Rory Mcilroy I hope it was full! Great playing Rory!!! Amazing to watch from the UK. Rory Mcilroy FAB FAB FAB FAB FAB FAB - so tired today having stayed up to watch all week! Couldn't be happier for you - fantastic win - brilliant golf all week!! #bouncebackability!! The special taste of Victory!!! Rory Mcilroy what an achievement. The whole world was behind you mate. Have a good one, you deserve it! Yeaaaa buddy! That's well deserved! Congrats! Well deserved Session on the cards.........best golf I saw in years, congrats Rory, awesome display, have a good one. Rory Mcilroy Ahhh, An adult beverage served in a Sterling Jug must taste SWEET!!!!!! Rory Mcilroy so pleased for you. You made it an absolute joy to watch! Here's to a very rory future for golf! Rory Mcilroy Congratulations Rory. In the words of LeBron, "Not one, not two, not three, not four . . ."
Rory Mcilroy Fantastic ,great golf all week,well done mate. Rory Mcilroy it is richly deserved and I am sure just the first of many! I'd say that's the best drink you've ever had in your entire life... great job, Rory! You were amazing these past four days! Rory Mcilroy - Well deserved! European and PGA Tour golfer. Big Manchester United and Ulster rugby fan. Love going back home to Northern Ireland to spend time with friends and family.